For this, we have to go back to the basics of SIM card i.e. Subscriber Identity Module. In Layman language, a SIM card acts as the link between an individual’s cell tower and the phone’s baseband chip. Now, when it comes to the question does iPhone have a SIM card? The answer is “Yes, of course”. SIM cards are installed in the iPhone using the SIM tray available on the side of the iPhone. Today we are going to discuss about the iPhone SIM cards, activating the iPhone and if encountered an error while activation, we are going to resolve such issues too. With the advent of technology every passing day, SIM cards have also evolved over the past years with their sizes and compatibility to various phones. Although SIM cards did maintain a thickness of just 1mm initially, it used to be as big as the size of credit cards but gradually, their size was reduced and made compact by shrinking the dimensions to the nano SIM cards available today. The modern-day SIM cards make it important for the contact footprint to be as small as possible without hampering any of the features of the embedded chip in a SIM card. 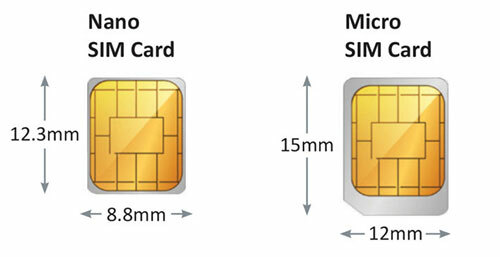 Nano SIM card is by far the smallest SIM card. It has the mere dimension of 12.3mm x 8.8mm x 0.67mm and can hold the same data as the earlier versions. It is the 4FF (Fourth Form Factor) SIM card with a reduced dimension of almost 42% of the original SIM card. The higher versions of iPhones starting from iPhone 5 use nano SIM cards. The micro SIM cards are still popularly used by many high-end smartphones, even the original configurations of iPad, still use them. They are larger than the nano SIMs only by a slight percentage having the dimension of 15mm x 12mm x 0.76mm. For example, iPhone 4s still operates with micro SIM card. 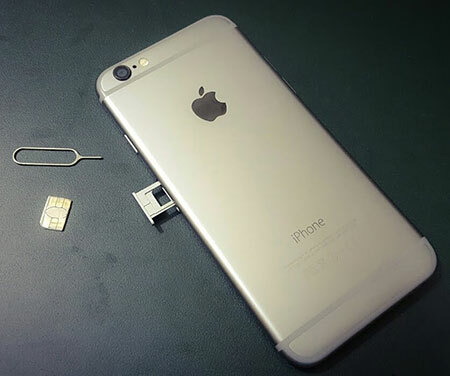 Inserting a SIM card in an iPhone can be tricky for some of us as it is quite a different process than inserting it into any other smartphone. SIM cards usually come in all three sizes viz micro, mini and nano and it depends upon the user to choose the size which is compatible with their phone. Adapters are also available for nano SIM cards for them to fit into slots of micro and mini SIM cards. 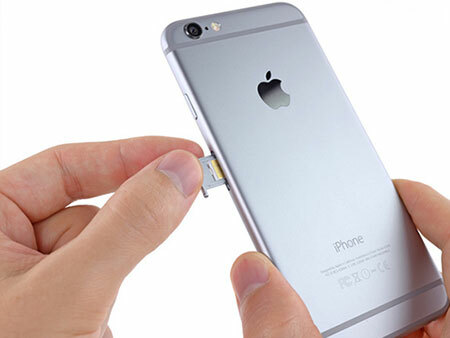 Here is a simple stepwise procedure to help you insert your SIM card in your iPhone. Firstly, you need to make sure the SIM card is compatible with your iPhone as some of the older versions of SIM cards are not supported in the newer models of iPhones and vice versa. 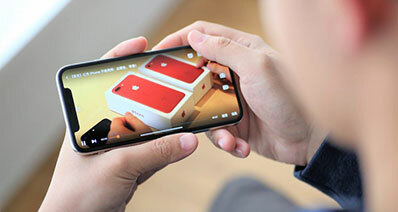 For most of the iPhones, the SIM tray is located at the right side of the phone. You need to eject the tray by pushing the SIM eject tool into the tray until it pops out. This SIM eject tool comes along with the original iPhone package. Next you need to carefully pull out the SIM tray as it is very fragile and you need to appropriately place your SIM card on this tray. After placing the SIM card on the tray, you need to push it back in until you hear a clicking sound. In case you need to replace your SIM card or remove it altogether, here are the simple steps of how to do so. 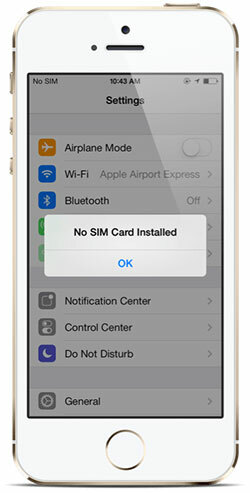 Firstly, you need to eject the SIM tray using the Apple SIM ejecting tool. If you don’t have one, you can also use a paperclip by bending it and using the pointy section. 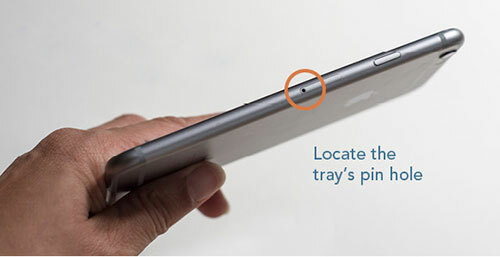 Once the tray pops out, you need to carefully remove the SIM card from it. Next you need to push the tray back in using the same tool. Do keep in mind not to push force the tray. Otherwise you will be left with a damaged tray and it would not support any SIM card in the future. Most of the activation processes of iPhones work smoothly but you might come face to face with a situation when due to utter bad luck, your SIM card stops responding to your new iPhone. 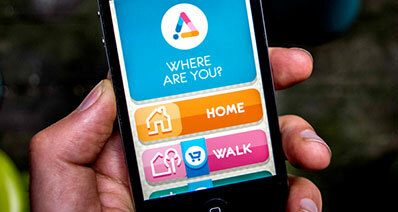 It may also happen that you do not have a SIM card accessible at the moment but an all-new iPhone ready to explore. To add to your misery, you might not as well have Wi-Fi. Don’t give up yet. 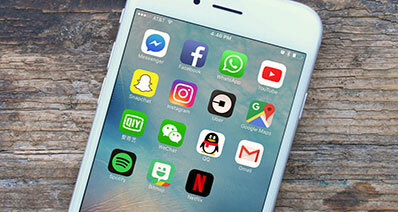 We have 5 methods for you to start your iPhone without having any of the above mentioned leverages with a simple click of this mentioned link: How to Activate iPhone without SIM Card. You may come across an unfortunate glitch sometimes with your iPhone displaying “No SIM Card Installed’ or “Insert SIM” even though you have a proper working SIM card installed. There is no exact information as to why this occurs but you suffer from zero cellular networks in such cases. Usually, these issues can be resolved by yourself if you follow these two methods. Method one should suffice but some rare scenarios require Method 2. Apple also recommends updating your iPhone to the latest version for resolving this problem. In the worst scenario if neither of the method works, check for a faulty SIM. The best way however, would be to install iSkysoft Toolbox - iOS System Recovery in your PC as it is a highly recommended and proven way to fix your iOS firmware related SIM card issues. Additionally, iSkysoft Toolbox is quite handy as it resolves multiple other issues related to iOS firmware simultaneously and easily without having you to waste much time or storm your brains out with the process involved. The tool is fully compatible with both Windows and Mac operating systems. 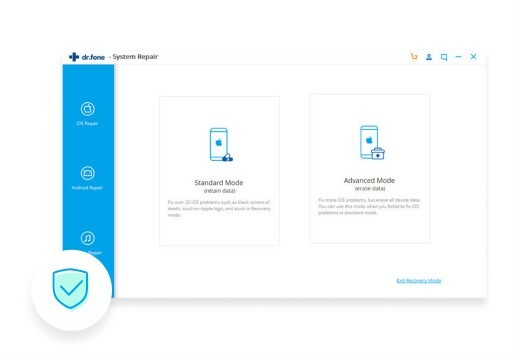 Moreover, it does not come with any risk or harm towards your data or the iOS device connected to your PC during the fixing process. The tool ensures resolution of your iOS issues without any sort of data loss. You can easily resolve multiple iOS glitches like iPhone stuck in Apple logo/DFU mode/recovery mode/frozen status etc. in one go with the iSkysoft Toolbox – iOS System Recovery tool. Trusted and recommended by millions of users, the iSkysoft Toolbox – iOS System Recovery tool is absolutely safe, reliable and secure. The tool supports all the iOS devices which are running on iOS version 7 or higher. 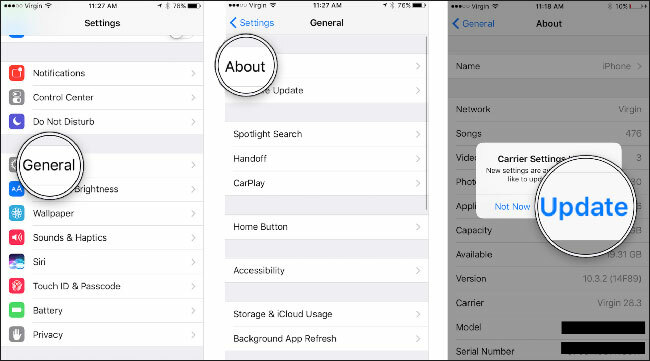 To update your carrier settings, go to ‘Settings’ >’General’ > ‘About’. A prompt update might sometimes appear here. Just tap ‘Update’. 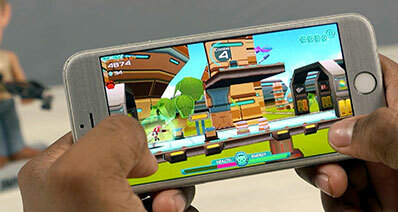 Your problem is now solved and it was glitching due to some changes made by the carrier company in the network settings. 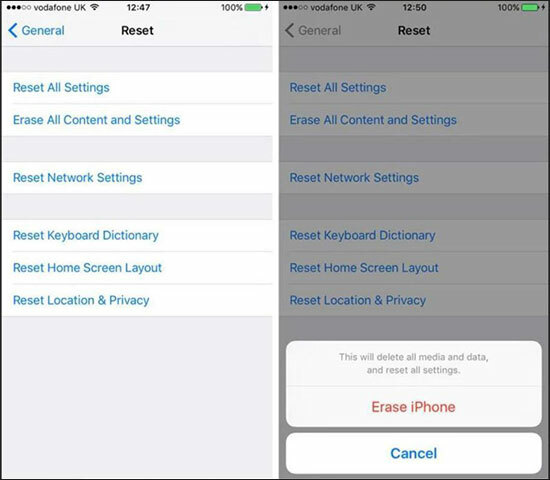 If you have followed the first step and your iPhone still shows ‘insert SIM card”, you would need to restore your phone to the default factory settings. Make sure to create a backup using iCloud or iTunes because restoring your phone deletes all the data from your phone. After you have backed up your data go to ‘Settings’ > ‘Reset’ > ‘Erase All Content and Settings’. This erases your information entirely.